Our electro-motor spindle are mainly applied in high speed inside and outside round grinding, high speed drilling, milling and carving, woodworking carving and milling, etc. Our electro-motor spindle have 4 categories, 12 series and 200 varieties. Our electric spindle motor are exported to many famous international bearing cooperations of Janpan, America and Europe, etc. Electric drilling and milling spindle includes ADX and ADM series. The numerical control driller, miller, carver, woodworking carver and miller,etc. Belt spindle includes PZ and MX series,which are applied in inside and outside round grinding and woodworking machine tool. These electric spindle motor all mate many major machine tools factories at home and abroad. Numerical control machine spindles includes ADS,ADP series for numerical control milling and machine centre. Electric grinding spindles have 4series of AD, ADW, ADL, ADQ. AD series are applied in the grinding below a speed of 40min/s of the grinding wheel.ADW,ADL,ADQ are separately applied in grinding at a speed of 50min/s,60m/s and 70m/s. 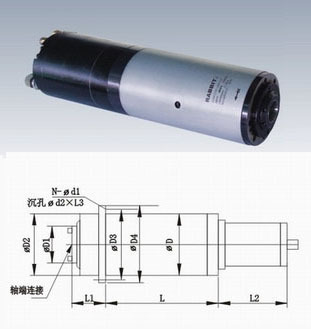 Among them, ADQ series is a kind of high rigidity and strong power electric spindle, whose standards have been up to the advanced international level. Morever, our company can develop and produce special high frequency electric spindle for special usage and specifications to meet the needs of old and new customers. We also provide warm services for you! Anyang General International Co.,Ltd(AGICO) is a leading manufacture and service provider of superior quality Electric Spindle Motor, Electro-Motor Spindle, High Frequency Electric Spindle.